Want your dish to steal the show at your Labor Day cookout? 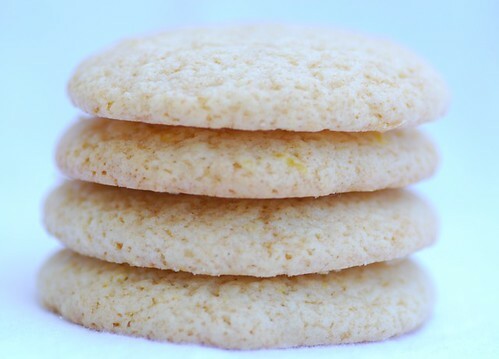 Bake a batch or two of sweet-tart lemonade cookies. If you're thinking, "Hmmm... where have I heard of lemonade cookies before?" I'll tell you: Cat Cora, the talent and adorable chef who cooks from the hip. I made Cat's lemonade cookies; unfortunately, they didn't come out as perfectly as hers. The first batch spread. For the second batch, I employed all of my cookie baking tricks: I didn't over beat the batter; I reduced the butter, and I chilled both the baking sheets and the cookie dough before placing them in the oven. The result? The cookies S-P-R-E-A-D.
As I stood at the kitchen counter nibbling the crisp edges of the mono-cookie on my baking sheet, sweat beading up on my brow, it hit me, "I know what it is! It's that damn Baja hurricane pushing thick, tropical, humid air into San Diego!" No matter the cause, I was determined. Stubborn. 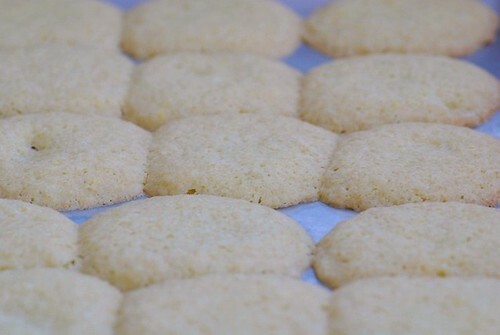 I would bake a successful batch of lemonade cookies. This time, I decided to go all-out. I combined Cat Cora's lemonade with Anita's delightful cookie batter and my mom's no-fail lemon icing for her lemon biscuits. I thought, "This time it's gonna work. Dammit." When my oven timer went off, I peered in the oven with one eye. Ah, individual cookies! Victory! I don't know if it was my recipe, the increase in barometric pressure, or dumb luck, but the result was 12 distinct cookies. Lemon cookies are so tasty and almost refreshing to eat. I love the use of lemonade in these! Victory tastes oh so good - especially when it's a baked good. Very interesting recipe indeed, must try these, thanks for sharing. Grit and determination at the stove pays off in the end! And, I'm sure there was some decent sampling - to get to the heart of the issue - along the way! Lemonade...how different! They look yummy, I love a simple cookie! These look so lovely! It is very humid in Washington, DC and one banana cake i made a few weeks ago just completely succumbed to it (it i did not help it was full of agave instead of sugar). Lemonade adds a great flavor to anything, especially cookies :) Thanks for sharing! love the idea!! just Fantastic! These delightful little cookies look wonderful! These sound delicious! Great idea to combine the recipes. I used to really dislike lemon sweets when I was younger but I can't get enough of them now. I have a thing for lemon cookies, and these sound fantastic. I've just been trying a few cookie recipes this week, and now here's another to add to the list! These look delicious. I bet they would make a yummy ice cream sandwich with vanilla bean ice cream. Can't wait to try them (and so glad you worked out the kinks for us)! Thanks for the comments in my blog dear! the cookies are so tempting and have a gr8 long weekend! sean-Victory does indeed taste sweet. orce-Thanks. Wait till you taste them! ronell-Hey, Ronell! It's so great to hear from you. Wish we could nibble on a few cookies and chat. citygirl-Glad to hear I'm not alone. The hot weather really isn't kind to baking. elly-I'm glad you like them now! lisa-Make sure you keep the AC cranked! mommychef-Mmm... now that's a delicious idea. Thanks! vs-You're so welcome! Have a great wkend too. Hope it's filled with cookies! Yay, well done for trying so many times to get the perfect cookie. Got any left for me? Those cookies definitely look worth it, yum! Oh! I am sure that I'll like these cookies...lemony, sound and look so yummie, refreshing! Wonderful cookies using the lemonade, the cookies look so light and I love the pale colour - so appetizing. What perfect looking cookies! I love lemon in baked goods. I made Cat's recipe today and I think you might have just made the cookies too big. I think she really means a rounded teaspoonful instead of a normal spoon (that I normally use for cookies). They do spread quite a bit since the dough is so fluffy. I used room temperature dough b/c I think sometimes it is harder to judge when the cookie is done when you use cold. Your recipe looks good too and I will definitely try both!